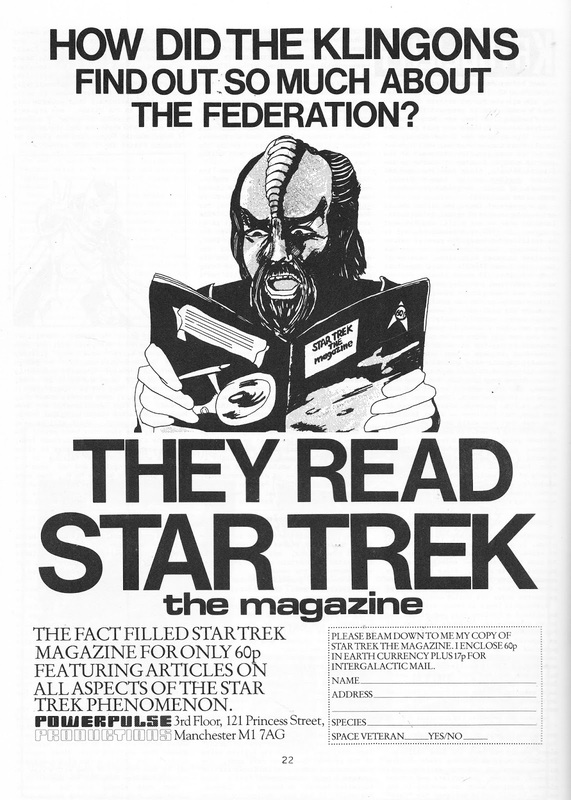 From August 1980: a fanzine ad for STAR TREK THE MAGAZINE. I don't know much about this one... despite the official-sounding title I suspect this was actually a fanzine. It's a UK address on the advert but they may have simply been acting as agents for a US publisher. Paramount's lawyers may have turned a blind eye to fandom (it did keep reruns of the show on the air and movies in theatres) but I think a title that grand was probably a step too far, especially if it stopped the studio signing a commercial deal with a real publisher. i assume it is not to be confused with TREK, the seldom-seen fanzine that spawned the series of paperback books collecting articles from the 'zine throughout the 1980s. They were once certain secondhand bookstore fodder but seem to have become a lot rarer in the wild over the last decade or so. it sounds like a one-shot publication ( assuming it was even published ).